Budding trumpet players can often improve their sound and playing experience by simply changing the mouthpiece they use. It’s such a small part of the instrument as a whole, but playing the correct model is incredibly important. Now, we could write an encyclopedia about all the different models and measurements mouthpieces come in, but in today’s blog post we are going to focus on helping young musicians understand how the components of their mouthpiece can affect their trumpet playing. The mouthpiece and its dimensions you choose are going to affect many aspects of your trumpet playing such as intonation (the ability to stay in pitch), ease of attack, range, volume, flexibility, tone, and comfort. Secondly, it’s important to understand that most beginner-level trumpets come with mouthpieces that have shallower cup depths and medium cup diameters (such as a Bach 7C or Bach 5C). A shallower cup is a bit easier for inexperienced players to produce a sound. As the student progresses in his or her musicianship, they may consider going to a deeper cup such as a Bach 3C. Why consider a deeper cup depth? A deeper cup allows more air flow. More air flow means a warmer, richer tone as well as increased volume and range. On the flip side, a mouthpiece such as the Yamaha Bobby Shew Lead mouthpiece has a very shallow cup depth and a narrow backbore. This provides the musician with an extra bright sound and upper register which is ideal for serious jazz trumpeters who need to hit those screaming double-G’s! Also, it does not hurt to consider the plating of the mouthpiece. 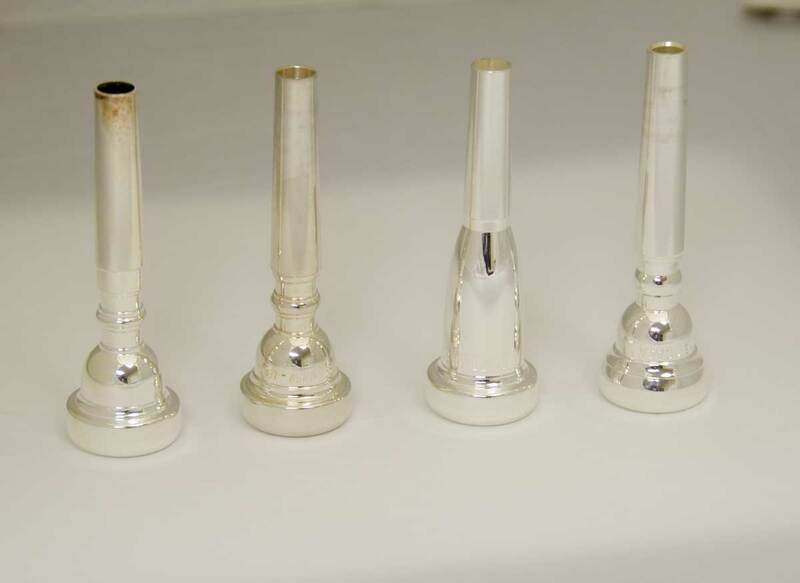 Most mouthpieces will be silver plated since silver produces a brighter sound. However, there are a variety of trumpet mouthpieces where the rim, cup, and even the entire mouthpiece, are gold plated. The reason for considering gold plating can vary. Some like the softer feel of the gold plating against the embouchure while others like the warmer sound gold plating provides. There are even musicians with silver allergies, so the gold plating is a great alternative. When trying new mouthpiece models, start on a mid-range note, such a G on the staff, and go up chromatically to see if there is an improvement in range and if those higher notes are easier to hit with a good sound. Do the same going down chromatically into the lower register. 1) Is my range increasing (upper and lower)? 2) Am I producing the kind of sound I want (classical, jazz, big band, etc.)? 3) Has my intonation improved? 4) Do I have better attacks at the front of my notes? You are welcome to bring your instrument into Paige’s Music to try a variety of mouthpieces in one of our practice rooms! Your band director or private teacher may have suggestions for particular makes and models they would like you to try, but if you are not sure where to start in your mouthpiece journey, our Sales Associates can help you pinpoint your current ability and have you try models which may help you meet your musical goals. Back-to-school season is upon us and it always brings up the question of our store hours during the months of August and September. We don’t have extended hours during back-to-school season, however, we do make some staff adjustments during this time. We’ll have extra people in-store both during the week and on the weekends to serve our customers more efficiently. It’s a very busy time at Paige’s but we’re prepared to serve you as fast as we can so the music making can begin smoothly. If you don’t have time to make it to the store, you can always take care of your rental instrument by visiting our website. You can read all about our online rental on our post from a couple of weeks ago. It tells all about our Debut Rental Plan and how you can access it from pretty much any device. As always, if you have any questions you can contact us by email at sales@paigesmusic.com or by phone at 1-800-382-1099. Daily care and maintenance of your instrument is very important to how well your instrument performs. Watch this quick video below for a few, quick tips on caring for your oboe. We’re back with a very timely Frequently Asked Question: Do I have to come to your store to rent an instrument for my student? The answer is no, you do not. You can visit our website at www.paigesmusic.com and click on the graphic at the top that says: Click Here to Rent Online. It’s red and hard to miss! (See above) Go ahead, give it a try. We’ll deliver your student’s instrument the next time we visit your school, ship it to your home via UPS, or you can schedule a time to pick it up at our store. Back to school time is right around the corner, so now is a good time to take care of your instrument rental for the upcoming school year. As always, if you have any questions, please contact us by phone at 1-800-382-1099 or by email at sales@paigesmusic.com. A few months ago we talked about how important it is for a reed player to have a good, well-made reed. It is one of the most integral parts to their set-up to get the sound they are looking for. At that time we discussed all of the different reed cuts that Vandoren makes. This time we are going to look at the other major reed brand, Rico/D’addario. D’addario purchased Rico in 2004 and in that time they have worked tirelessly to provide the reeds that players need to get their “voice”. They have invested heavily in new technology to make the reeds better and more consistent than they ever have been before. D’addario grows 100 percent of their own cane which gives them control of the materials throughout the entire process. 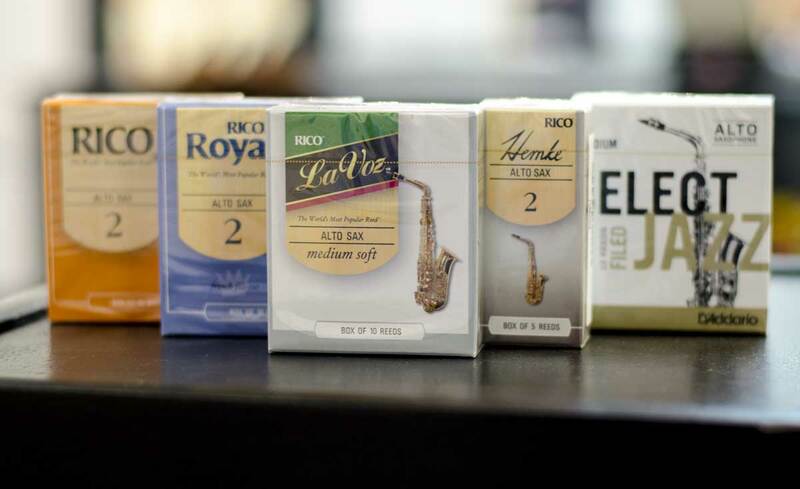 Below we have laid out the different models of Rico/D’addario reeds that we stock and the features of them. Rico– This is the standard orange box that we have seen for years. This reed is unfiled and has thinner profile and blank. They are cut from the most flexible grade of cane. They vibrate easy which make them a great reed for Jazz players and students that are just learning how to play. 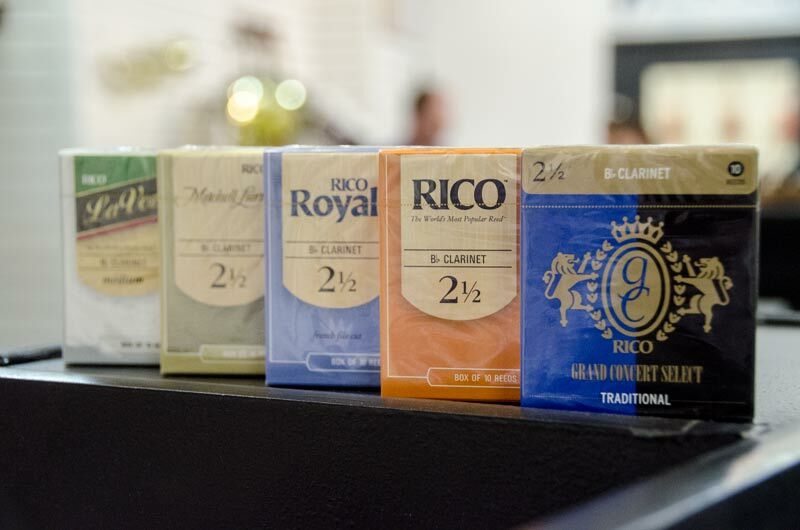 Rico Royal– This reed combines the features of the standard Rico reed with a French File. The filing gives it an increased response, especially in the lower register. This is designed for an advancing player as it offers an even response across all of the registers. Mitchell Lurie– Mitchell Lurie reeds are unfiled and have a thinner tip for an ease of response. This, with the addition of a thicker spine, make the reed more resistant with a warmer sound. Available in filed (Mitchell Lurie Premium) as well. Reserve Classic– A premium, filed reed with a thick blank that offers tonal depth. It also features a longer vamp for flexibility and a thicker tip for clear articulation. La Voz– La Voz reeds are similar to the Rico cut. It is unfiled and has a thinner profile and blank. They have a deep powerful tone, due to the stronger spine, which gives greater resistance. Grand Concert Select Traditional– This reed is filed and features a traditional tip with a thicker spine. It has a quick response with a darker tone. Hemke– The Frederick L. Hemke reeds are filed and have a thinner tip and shorter vamp. This gives the player an easier time in getting a good response out of the reed. They shorter vamp also provides the player with a darker tone which make it a favorite of many classical players. Reserve– A premium, filed reed with a thick blank that provides a rich, warm tone. It features a heavy spine that promotes dynamic flexibility and exceptional tone in all registers. It also has a traditional tip thickness for ease of articulation. Select Jazz– This reed offers the thickest spine and blank of the D’addario reed line. They have a traditional tip as well. A well-defined heart and longer vamp gives the Select Jazz great projection, focus, a vibrant sound, and fast response. They are offered in both filed and unfiled models. Most wooden oboes and clarinets are made of granadilla wood. It is a very dense and stable wood and is very carefully aged and treated before it is made into an instrument. However, it is a piece of wood and therefore is subject to the will of a natural organic product. It is often commented on in professional circles that it is not a matter of “if” your instrument is going to crack but a matter of “when it will” crack. More so with oboes than clarinets. At this point the instrument is not ruined ordefective, it just needs repaired. Something we do all the time. We seal the crack up using one of several different methods and that usually takes care of the problem. However it is also important to note that sometimes a crack will re-appear after it has been repaired at which time we would repeat the same process. Take precautions. Do not keep wood instruments in extreme cold or hot conditions. (Mostly talking about your car here.) When getting ready to play, let the instrument adjust to the room temperature. Then blow some warm air through the instrument before starting to play it. Proper maintenance. Swab the bore out after playing every time. Use a good quality absorbent swab and do not leave it inside the bore of the instrument. Have your instrument checked annually for need of bore oil. Special note: too much oil is worse for the instrument than not enough. It is used very sparingly. Here is an excerpt from Yamaha on care of your Yamaha clarinet or oboe. It pretty much applies across the board on all brands and types of wooden instruments. Yamaha clarinets and oboes are made from African Grenadilla, carefully aged and treated, then crafted into fine musical instruments. Grenadilla is one of the hardest, most dense and stable woods available and is the wood of choice for manufacturing the best clarinets and oboes. Yamaha employs a combination of some of the most innovative, modern machinery and traditional hand craftsmanship to make woodwinds that are highly regarded for their consistent quality, tone and intonation. Beyond maintenance procedures used for plastic oboes and clarinets, these are some steps we recommend to properly "break-in" and maintain your carefully crafted wood instrument. 1. Avoid playing the instrument when it is very cold to the touch! It needs to warm up to the air temperature of the room or outdoor environment, gradually if possible, before warm air is blown through it! Holding the instrument under a jacket, or just opening the case 20-30 minutes in the room before playing can be helpful. 2. When playing for longer periods of time, swab out more frequently a "handkerchief-type" swab can often do a better job than other types. It is important that the swab is not overly tight when pulled through. Any attempt to force a tight swab through should be avoided before the bottom end of the swab disappears into the joint, so that it can be carefully backed out. 3. Generally, the treated wood of a new Yamaha instrument or joint doesn’t need further treating, but if the bore (interior surface) gets a very dull, dry look, careful application of bore oil can help seal the wood to prevent excessive moisture absorption-another potential cause of cracking. An overly dry bore, with many open-grain surfaces can actually play like the bore was a bit oversized, changing tone and intonation characteristics. A conservative approach to oiling is recommended-both in the amount of oil applied, and the frequency. Excessive oil can gum-up pads and affect tone. Apply a few drops of good quality bore oil on a soft stick-type swab, or a handkerchief swab (just for that purpose) and draw it through the joint, repeating the process until the bore has a uniform sheen and is not overly wet. If a stick swab is used, open any closed keys and blow a focused airstream into all tone holes to blow out any excess lint. A dry bore can be treated a couple of times in a six month period, and then once or twice a year if needed. Some instruments have a more highly polished bore that needs little or no oiling. Some players have the bore polished with beeswax or furniture wax-although this can affect tone, as can excessive oiling. These steps will provide proper maintenance for your wood Yamaha oboe or clarinet, and help prevent surface cracking. In the unlikely event that a crack develops, it is not as serious a problem as you first might think. Many artist/performers and teachers play on instruments that have properly repaired cracks-some even feel that it "frees-up" the sound, and causes the instrument to play better! Fine wood instruments should be treated with respect, but also played and enjoyed for the warm tonal characteristics they yield. It is very important that good care and maintenance is provided. In addition to owner care, this involves regular visits to a reputable woodwind technician-much like what is involved in maintaining a car. This can be several times a year for some students and frequent players, or as little as once every few years. Worn pads should be replaced with quality pads as needed, to ensure good tone hole covering. Key openings and adjustments (key regulation) need to be checked/adjusted periodically. With these things in mind, your Yamaha Woodwind instrument will both provide years of musical use and enjoyment, and also maintain its value.